The fatted and slumbering bears were rudely awakened last week. The broad market was up 3.7% and the bulls reclaimed some hotly contested moving averages. I've presented for you a chart book with weekly, daily charts for the 24 major sectors. You can find that HERE. Additionally, I have all 148 Sector sorted by performance (and also alphabetically, so that you can find sectors more easily). Let's take a look at the weekly performance chart (click to enlarge). I mentioned last week that we were within a feral cat's whisker of these lines crossing on the weekly chart. They have not crossed, and there was some upward progress. HOWEVER, the 13 week EMA is still pointing down, and the 34 week EMA is flat and has been pentrated. The market continues to digest news daily, and its mood swings have run quite a gamut--dealing thwacks to bulls and bears alike. To my eye, I'm seeing some constructive charts from our most recent swoon. Nevertheless, whether you are a bull or a bear, vigilance rather than complacency must be embraced. I wish you good trading next week. Keep your wits about you and remember the difference between bias and conviction generally is defined by dollars and time. Always make sure you have a clear idea on how much you wish to pay and how long you want to wait. 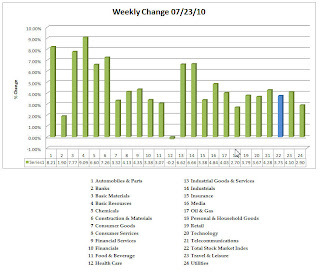 Update: This week will be my LAST Weekly Sector Report. Why? FINVIZ offers a very easy and comprehensive view of the Sectors. I was looking at it this morning, and my simple conclusion was that my report was NO added value. Accordingly, I invite you to spend some time exploring FINVIZ's offerings. Start here. 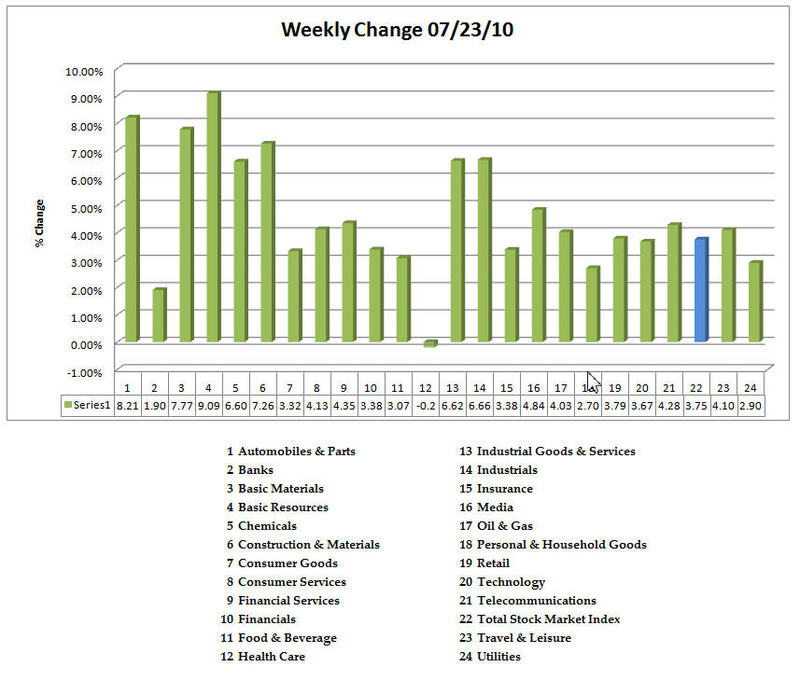 I'm reading: Weekly Sector Report | 06/23/10 (by Leisa) $$Tweet this!